Yes, despite being quiet on the subject for a while there has been knitting going on over the last few months, lots of it in fact. Whilst we were away not only did we visit some awesome places, I also got to knit in them, working up samples and perfecting a new pattern and doodling ideas for new patterns. 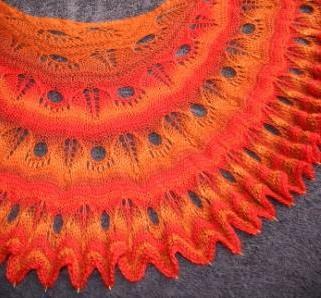 So I have a new shawl pattern that is currently with testknitters and already the feedback is both very affirming and very helpful. Anyone who’s tried to turn their own ideas, tacit knowledge and knitterly practices into a written format that other people can easily follow, will know how wonderful it is to have a group of enthusiastic and motivated knitters give it a good going over. Moreover, as knitting patterns are increasingly accessible globally, via Ravelry for example, it’s important to make sure than the systems of notation and terminology that have grown up quite locally also translate and don’t cause confusion. This is perhaps the steepest learning curve and my testknitters have been wonderful in sharing with me their practices and methods of negotiating yarn weights and yardages etc. which I find especially important in terms of enabling people to knit my patterns with yarn they may have in their stash or available locally. I may have moaned on previously about my lack of a really good LYS (Local Yarn Store/Shop) so I too, often work from what I have around the place. This may also be a result of my tendency towards impatience, I just can’t wait to have time to spend the day getting on the train and going to Manchester to Purl City Yarns to find the perfect yarn – I want to start playing with the idea now and that needs yarn… now. 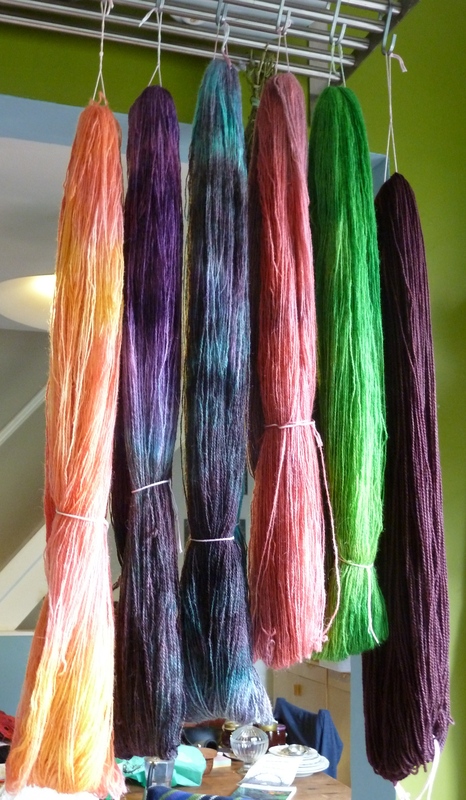 However, choosing the correct yarn, even from the very diverse stash I have can be challenging. I’ve been working on a new hat pattern and was looking for a nice DK wool that hs some backbone to it, a silky slippery yarn just wouldn’t achieve the fabric characteristics I was after. I had done two prototypes, the hat started as one thing but revealed other possibilities which I also explored, both of which are now being written into the pattern. These prototypes were made from the leftover hand dyed vintage wool that I had used for my Wedding Cardigan, and from a wonderful vintage tweedy wool left over from a Ferla Box Bag. 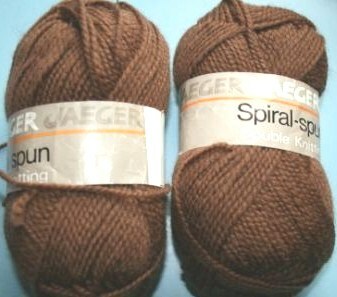 Rummaging in my stash I found some lovely vintage Jaeger spiral spun yarn, I love the twist to this yarn and have some in blue, a 25g ball in purple and brown and not a nice brown. I’ve struggled to photograph this but hopefully you can make out that it’s semi-solid and is a rich chestnut with a hint of plum – it looks great with the little bit of purple I want to match it with in the pattern and now I’m excited about testing out the next size – this will be my size! 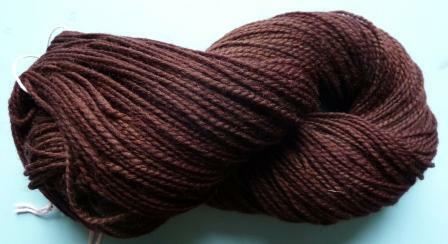 I’m still looking for some nice 100% DK wool, non slippy yarn. I had checked out internet sellers and Indie dyers but found little on offer – Have I been looking in the wrong places? 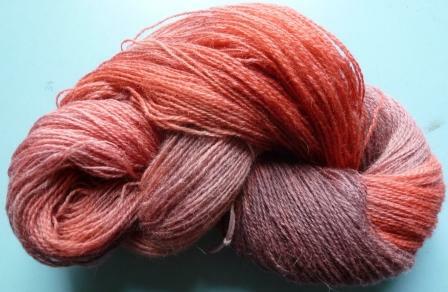 Recommendations for semi-solid or mildly variegated in tonal colours DK wool would be most appreciated. A semi solid green dyed using Sugarflair gooseberry and Langhams green food colouring. It shifts from a nice yellow green to a bluer hue of green. I’m quite a fan of green and whilst this is less spectacular than some of the others I rather like it. 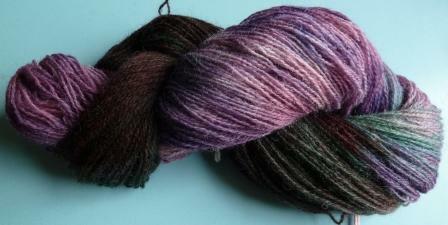 A dusky pink to purple yarn that was dyed all over with Silver Spoon pink food colouring which produced the nice dusky pink base which was then enhanced with Kool Aid black cherry and grape. This is a colour combination I’ve used a few times and I still like it, despite not being a great fan of pink. Fruit punch dyed with lemonade, mango, orange and watermelon kiwi Kool Aid. More orange and yellow than I would usually go for but I rather like how this has come out – a nice combination of summer and autumn perhaps with sufficient brightness for those darker autumn days. Turquoise, black and ooops purple. This was dyed with ice blue raspberry Kool Aid and Dr Oetker Black food colouring. The purple was an ooops because I wanted to mixed some little bits of black into the turquoise sections, but accidentally dipped into the jug of purple dye which was very concentrated instead of the black! Very nice – both the colours and the shawl.